Creates a void container for composing elements horizontally. It is a box that arranges the elements it contains from left to right. child,... : List of identifiers that will be placed in the box. NULL must be used to define the end of the list in C. It can be empty in C or Lua, not in LED. ALIGNMENT (non inheritable): Vertically aligns the elements. Possible values: "ATOP", "ACENTER", "ABOTTOM". Default: "ATOP". 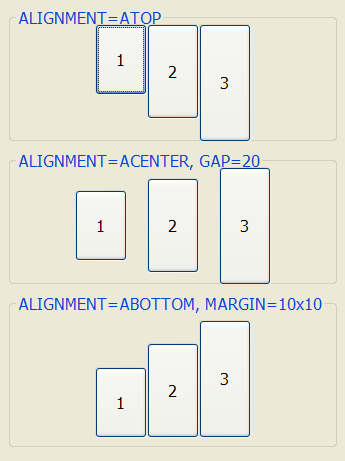 SIZE / RASTERSIZE (non inheritable): Defines the width of the box. When consulted behaves as the standard SIZE/RASTERSIZE attributes. The standard format "wxh" can also be used, but height will be ignored (since 3.3).